The Magnolia Hotshots may finally be getting their groove this season. They routed the Alaska Aces, 103-86 to win their second game and move up the standings. The Hotshots got their second win in six games. They move up to 10th after starting the season at the bottom of the standings. The Aces stay at fifth place with a 3-3 record. Ian Sangalang dominated the paint all game long. He scored 24 points, grabbed 14 rebounds, six assists with three blocks. He got a lot of help from Mark Barroca who added 19 points, four assists and five steals. Paul Lee added 20 points, eight rebounds and four assists off the bench. Chris Banchero led Alaska with 26 points. The Hotshots shut the Aces offense down. They forced 21 turnovers, as they got 15 steals as a team. Magnolia limited Alaska to just 40% shooting from the field and 24% from beyond the arc. 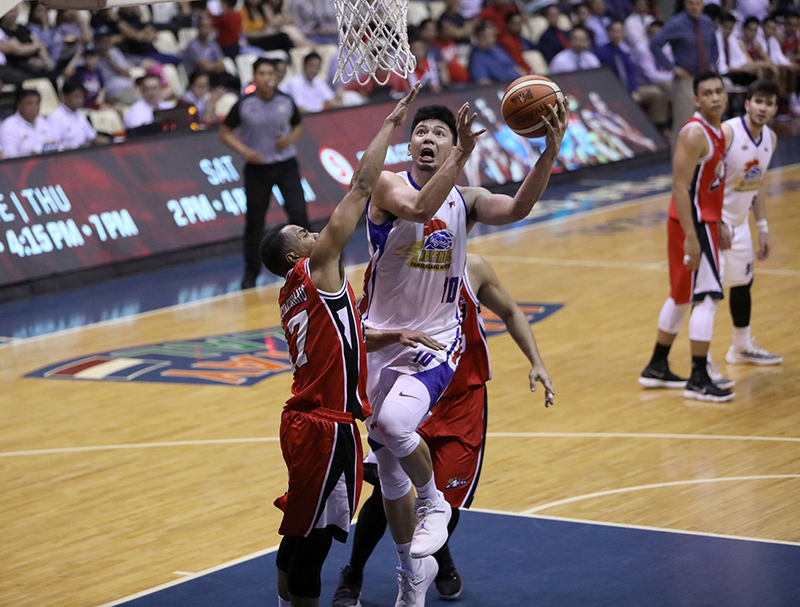 Coming off a tight loss in their last game, the Hotshots made sure that there would be no last-second heroics from the Aces in this game. From a tied game in the first quarter, the Hotshots unleashed an 11-0 blast to open the second quarter. They pulled away from Alaska with that blast. 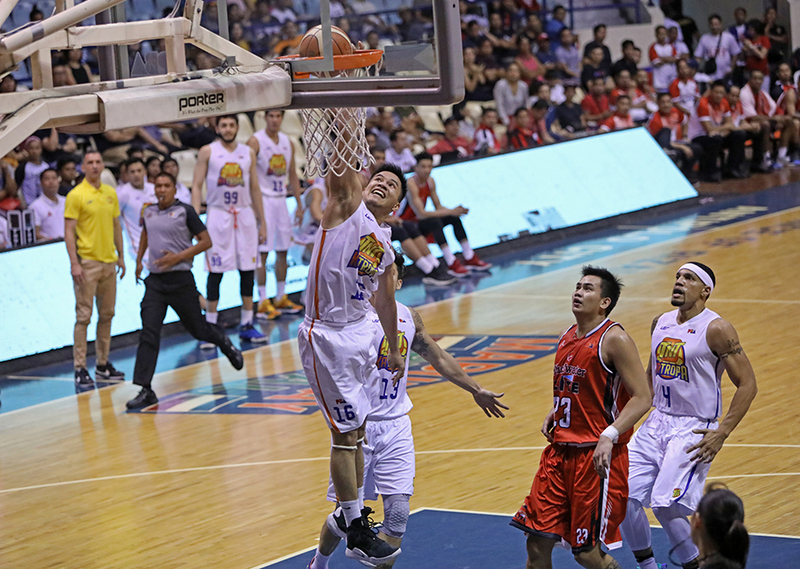 Barroca powered the run with five straight points while Lee added four points. Lee and Barroca continued their scoring run in the second half. They were joined by Ian Sangalang as the three formed the bulk of the Magnolia offense in the final two periods. Alaska was able to cut the lead down to eight midway through the final period. But that was their last stand. Sangalang scored six points in an 8-0 blast that restored order to the game. In the first game, the TNT KaTropa continued their winning run in dominant fashion. They rocked the Blackwater Elite, 127-89 to win their third straight game. TNT rises up to third with a 5-3 record while Blackwater sinks to the bottom of the standings at 2-7. RR Pogoy led five players in double figures with 28 points on 78% shooting. He was backed up by Jericho Cruz who scored 20 points on 66% shooting off the bench. Troy Rosario had 17 at a 66% clip. Mike Digregorio led Blackwater with 20. The KaTropa offense started off slow as they only scored 19 points in the first quarter. But they quickly picked it up in the second quarter where they exploded for 37 points. From a five-point lead, Pogoy started to get his offense going. He was getting to the paint for layups and floaters, setting the tone for the TNT attack. The KaTropa took an 11-point lead heading to the halftime break. The dam broke in the fourth quarter when TNT held Blackwater scoreless for the first seven minutes of the period. During that stretch the KaTropa went on a 26-0 run to increase the lead to a whopping 44 points. Pogoy opened the period with a floater to put TNT up by 20. After an Anthony Semerad layup, he then proceeded to score 10 straight points off back-to-back three-pointers. He capped his personal run with a surprise one-handed dunk. After that the rest of the team joined in on the scoring spree, as TNT trampled on Blackwater all the way to the end.